Having entered into the territory of the headquarters of the Russian gas monopolist in Nametkina Street in Moscow, activists rolled our banners "Stop gas blackmail" and "Stop the Gazprom". During the period of freezing weather in Europe the cold killed 500 people, mostly victims of the cold falls in Ukraine, where in the last week 135 people froze to death and in neighboring Poland the fatality was 82. 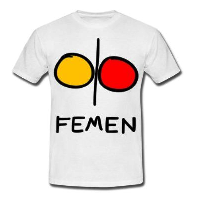 This entry was posted in English, Russia on February 13, 2012 by FEMEN.